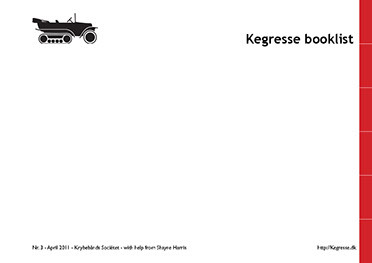 Here's some suggestions if you want to read more about Citroën Kégresses. At the Conservatoire Citroën in Aulnay two new volumes in the series of "dossiers" about the different classic Citroën models have been published here in 2011. 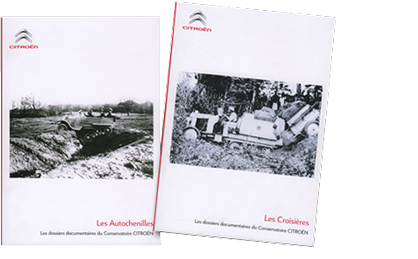 These "dossiers" are not really to be considered as books, but rather a collection of selected documents from the Citroën archives. The files exists on several other early Citroëns: Model A, C3 5HP, B2/B10/B12, C4, C6, C4 and C6 trucks, Rosalie 8, Rosalie 10, Rosalie 15, 2CV 4x4. And of course the new editions: "Les Autochenilles" (at 35€) and "Les Croisières" (at 50€). Together more than 500 pages of authentic ducumentation! These beautiful editions are a must-have for all Kegresse enthusiasts!